The team regroups for a timeout. 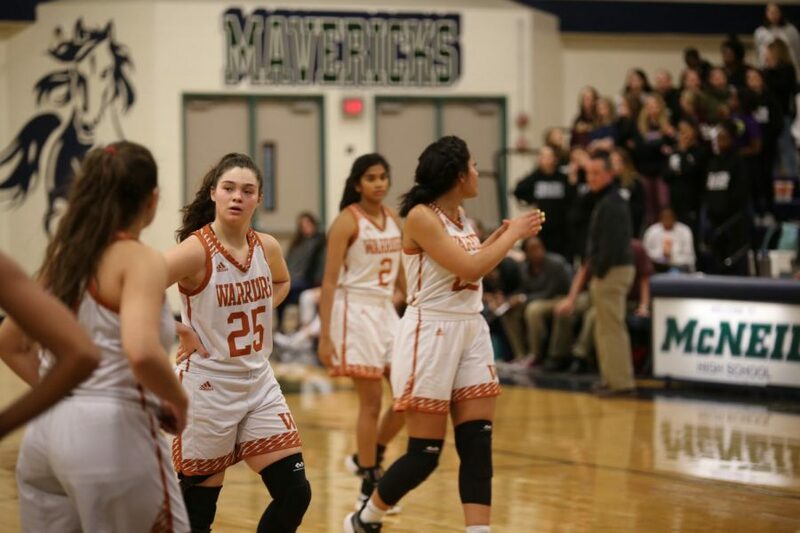 The varsity girls’ basketball team exacted their revenge against the Round Rock Dragons on Friday, Feb. 8 after a devastating defeat a couple weeks prior. This game determined which of the two teams would make it to the playoffs, making it the fifth time in a row for the Warriors. Despite the game being at McNeil High School, a massive amount of students were in attendance to cheer the Warriors on. Principal Mario Acosta was among them. The Warriors fell to the Dragons twice during the season, and the pressure was on for them to win. By halftime, the Warriors were only up by two points, but managed to gain a very substantial lead during the third quarter, and finished the game with a more than 10 point lead at 54-38. With the regular season over, the Warriors will now participate in the first round of the playoffs.